Conventional delay and sum beamformers are additive in nature. Another approach to forming a super directive beam in a specific direction is by the use of differential beamformers, distinctive from additive beamforming. The number of microphones available limits the order of the differential microphone array (DMA) beamforming. For N microphones, an N-1 order differential microphone beamforming is realized. Thus, for a first order DMA beamforming, two microphones are required. An advantage of using DMA beamforming is that the amplitude response tends to be flat. where is the desired beam direction and is a desired null direction. 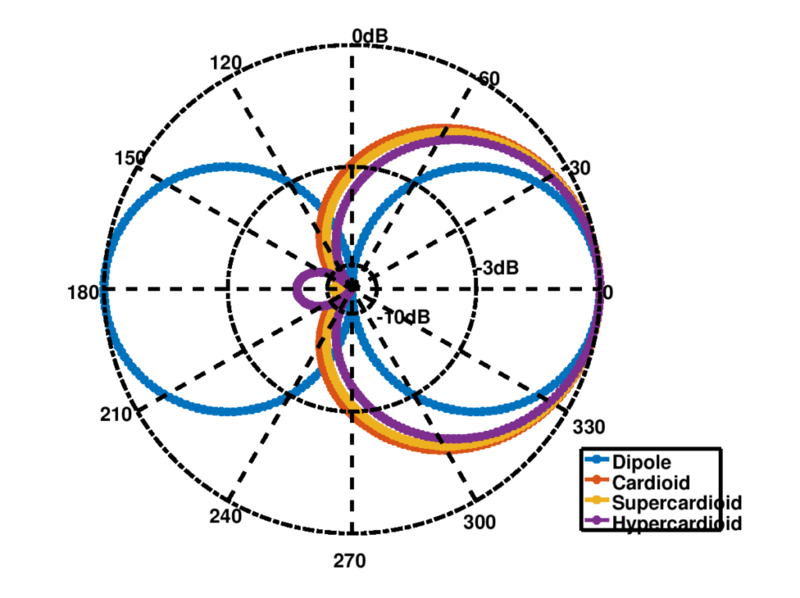 Given , the choice of will determine whether the spatial beam will be a dipole, cardiod, hypercardiod or supercardiod. Figure 2 below illustrates these 4 spatial beams.